Chinese sentence and Pinyin scrambles — taking a Chinese sentence and mixing up the character or Pinyin order — are great activities for Chinese language learners. These puzzles help train students' eyes and brains to recognize and remember Chinese words, Pinyin and the way they are structured. This tool lets Chinese language teachers easily generate Chinese word, sentence and Pinyin scrambles to use in the classroom. All you have to do is copy and paste (or enter) some sentences and click the Print button. This tool can intelligently detect the words in the sentences and generate the scrambles without breaking the words. If you want to generate the scrambles by shuffling the individual characters, you can do that by changing the default settings. To create Pinyin scrambles, make sure the option Pinyin is checked in settings #5. This tool supports both simplified and traditional Chinese characters. 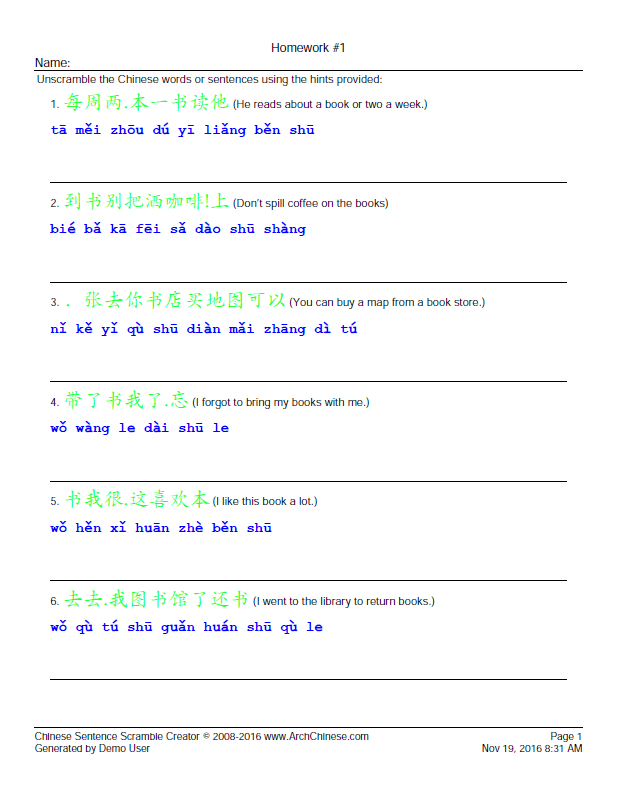 Enter the title of the new worksheet, such as Chinese Homework #1. The title will be shown at the top of the generated worksheets. It is also used to identify the word or sentence list when you save the list to the server. Enter Chinese phrase or sentence. You can copy or paste Chinese text from other sources, such as web pages or word documents, or enter them using your faovorite Chinese Input Method Editor(IME).Both simplified and traditional Chinese characters are supported. Optionally, enter the definition of the Chinese phrase or sentence in English (or your native language). You can click the E button to let the system fill in the definition for you if the Chinese is a commonly-used word. Click the P button to add Pinyin automatically. In the case that there are multiple pronunciations for a particular character, the system will attempt to use the right one based on its context. In some cases, the user may have to edit it. Do not use punctuation marks in the Pinyin input box. Note that Pinyin must be entered with tone numbers. The system will convert them to tone marks when the worksheet PDF is generated. In addition, the Pinyin syllables must be separated by a blank space. As an example, for the Chinese phrase 你去哪儿？, the Pinyin must be entered as ni3 qu4 na3 er2. Use v for ü, for example lv3 for lǚ, and number 5 for the neutral tone, e.g. ma5 (吗). Click the Add Rows button to add more rows. Empty or partially-filled rows will be ignored in the generated worksheet PDF. Optionally, change the default worksheet settings. The settings are self-explanatory. 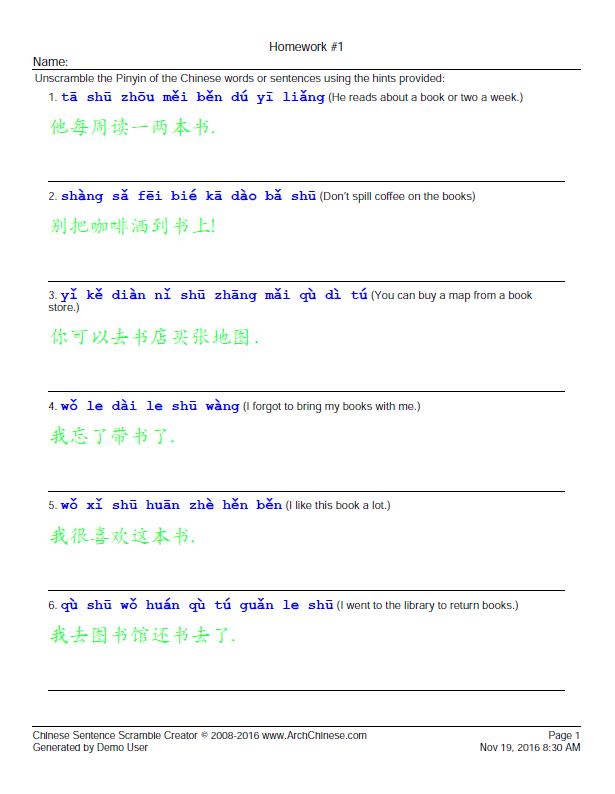 Click the color buttons to bring up the color pickers for Chinese, Pinyin and English text. Optionally, click the Save button to save the word or sentence list for future use. Note that this site uses a pop-up window to display the generated worksheet.If your browser is configured to block pop-ups, you need to allow this site to open pop-ups.